Core Rules: Forge Engine core system rules cover character creation and development, and attribute tests and skills, adventuring, and combat. Player Content: Everything players need to create, develop, and run their characters: traits, general skills, martial skills, magic skills, and equipment. GM Support: Instruction for game mastering Forge Engine games, advice for creating custom Forge Engine content, and adversary templates. Players: Forge Engine does one thing really well. 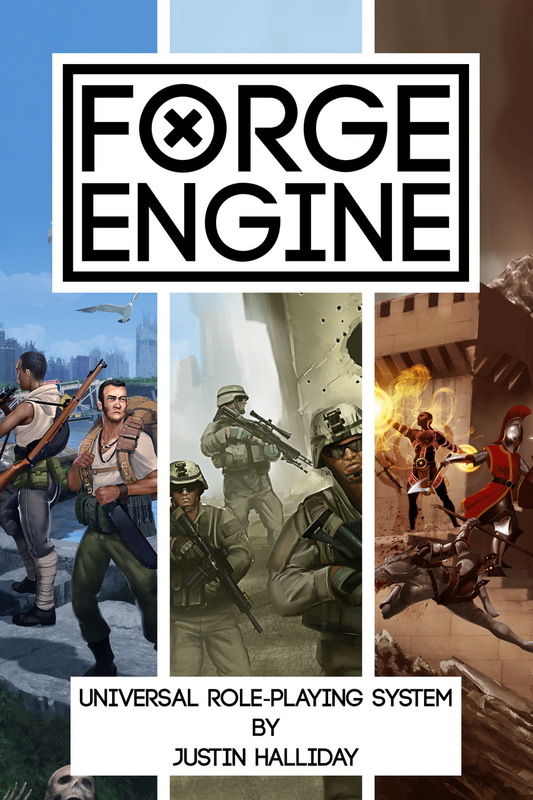 Forge Engine gives you, the player, complete control of every aspect of your character and your character’s actions. Game Masters: Forge Engine allows you to use the same system and content for historical, fantasy, modern, and sci-fi campaigns, and even those that combine all four. Creators: Forge Engine text content is released under a creative commons license, and will have a compatibility license for 'Forge Engine Compatible' branding. "Its better than, say, GURPS. I would absolutely rather play FORGE than GURPS. Or HERO." "This RPG has clearly been well thought out and whilst you might think 'who needs another RPG system?' I can assure you that you need this one!" "Just finished my first readthrough AND I LOVE IT! I've been looking for a new system to fit a custom setting I've been working on and this looks like it could do what I want to do with it!" "FORGE is like the D&D 4e of universal games. It has interesting mechanics I could really have fun playing with..."
Thanks for doing the math! You’re right, the numbers don’t add up. There’s a little bit of a secret adjustment for the species, where the hindrance traits are costed at -2CP, rather than the listed cost of -1CP. This is used to balance the species. Hi Justin, thanks for that. Yes I can really see the benefit of a secret adjustment otherwise every player would choose the negative traits. That will really help me build my own races for upcoming Lone Wolf and Fighting Fantasy adaptations I would like to work on. I also noticed that in the core rules, dwarfs are missing the Insensitive trait, which makes a lot more sense (otherwise they are a little overpowered). Incidentally, have you considered using a more narrative range system rather than the more tactical approach the rules cover? I was thinking of using 5 narrative range bands such as close, short, medium, long, far and have an Energy cost to move between each (1/2/3/4/5).